Horse Lovers will be right at home at the Lazy B Farm. Since it’s beginnings, the Lazy B Farm has always had horses around. The Bos family used to feed their cattle on the ranch with their horses, and now you and your guests can experience these noble steeds first hand. Tom and Jerry, our two Clydesdales would love to take your guests on a tour of the farm, overlooking Bozeman, Belgrade and Manhattan. You’ll love to experience the views of Gallatin Valley with nothing but the sound of the hooves walking across the pristine Montana hills. Hay Rides can be arranged throughout the evening, giving everyone an opportunity to see Montana in all of its beauty. 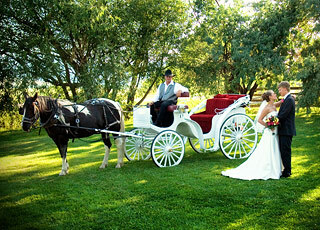 What could be more romantic than being delivered to your wedding day in a white carriage to the quiet sound of horses? Lonnie, our Paint, would love to deliver you on this day, and give you memories you won’t forget.